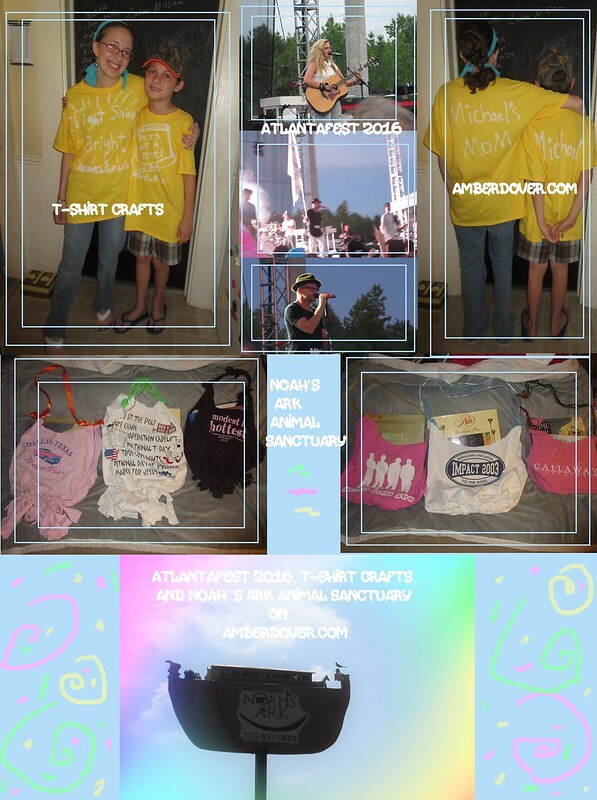 In this post: Michael and I go to Atlantafest to see Toby Mac and Hollyn in concert. Also, t-shirt crafts and a trip to Noah’s Ark Animal Sanctuary with a video of a talking parrot. Lastly, a video about The Pocket Testament League. We were super excited to take this mother-son trip. Leeland stayed home with Nana and my hubby. This was also Michael’s first contemporary Christian concert, and Leeland’s first night without me. I’m so glad we did this though. I didn’t want us getting lost amidst 2,000 people so I made us matching t-shirts. and to write Toby Mac song titles on the front. and Michael chose This is Not A Test. I tried to draw a hat that Toby Mac wears. Thankfully neither of us got lost. There was indeed over 2,000 people, but the school was so big that it felt like less. Before I move on to Atlantafest details, I want to share one more t-shirt craft that I did. Now, back to Atlantafest. We met several nice people. It truly was a Diverse City! The concerts (and there were several all day including speakers) were on the football field. Behind the stands there were food trucks, concessions, and long tents with all kinds of vendors. Some people were selling merchandise, but there were several ministries raising money for good causes. We didn’t get to do this, but the second day of the festival, attendees helped package food for the needy. I met and talked to a nice man who was giving out the gospel of John. He was with a ministry called The Pocket Testament League. He let me interview him. In the video, I say it’s me “again” because I had taken several videos. I’m not posting them though because I later found out we weren’t supposed to tape the concerts. You’ll have to take my word for it, they were awesome! It was hot, but so worth the money. We drank lemonade and ate pizza under the bleachers. We jumped and danced. Michael was amazed, but he was also worn out! The festival was also packed as I said before. The field got super crowded as the Toby Mac concert got nearer. We migrated to the front and had a wonderful view. I so wish I had a picture of everyone holding up their cell phones during Light Shine Bright. I have it on video though. I was really excited to see Hollyn. She is a talented Christian artist. Hollyn played before Toby Mac and then she sang with him during his concert. The highlight of the night was Toby Mac. His concert brought the works…lights and special effects. Don’t think that his music was less anointed, though. Toby Mac’s music is full of God’s truth and it’s clear he is a man of God. The lights didn’t steal the show from God. It got super crowded but I felt completely safe partying with God’s people. The love was definitely in the house. I thought Michael was going to fall out…the excitement and jumping around wore him out. He was sitting on the ground. I was still going though and I’ll admit that I felt somewhat younger. I went to many concerts as a youth, and the pastor that married Chris and I was actually the lead singer of a Christian Rock Band called Blind Men See. I would travel with them and sell t-shirts. The band didn’t last very long but they were good. At one time I thought I could live and travel with Christian festivals. I think I’d get burnt out eventually though. Well, we were half deaf, sweaty, and exhausted. We made it back to the van with our ears buzzing. We were so thankful to have a comfortable hotel to relax in. We stayed at The Comfort Suites near the school. The service was excellent and I highly recommend staying there if you go to Atlantafest. We booked a little late and somehow that landed us with a room with a jacuzzi. It was so nice! We decided to live it up while we could, so we ate our second dinner and watched t.v. while soaking in the tub! We watched the Disney channel for hours and just enjoyed hanging out like how we did before the baby came along. I had forgotten what it felt like. Noah’s Ark Animal Sanctuary in Locust Grove. The sanctuary is free but they ask for donations. Noah’s Ark rescues all kinds of animals. My favorite story is about a bear, lion, and tiger…BLT. They were rescued together and remain close friends. The full amazing story is on the website, which I’ll list at the end. We had a fun conversation with an Amazon parrot. I got it to say “Pretty Bird”, “I love you”, and some version of “Leeland”. You can hear it in the vid below. They had several gorgeous silver foxes. It was incredibly hot and many of the animals were hiding in the shade. So, a word to the wise, go when it’s cooler weather. I really enjoyed the birds that roamed about freely…like this stunning peacock. I was only a few feet away from it. The chickens were fun to watch as well. In closing, Locust Grove is a swell little town. The ark is definitely worth a visit, and you’re not far from Atlanta. Atlantafest is a bunch of fun and you can help others by attending. I hope you get to enjoy both venues. If you do I’d love to hear about your experience in the comments!